British Coptologist. Born, Capelrig, Renfrewshire 1865. Died, Bath 1944. Educated, Eton, 1879, then Balliol College, Oxford, BA 1888. Became interested in Egyptology whilst an undergraduate, and went to study hieroglyphs, ancient Egyptian and Coptic with W. N. Groff in Paris, then with A. Erman in Berlin. Hon. PhD. Berlin. Went on to specialise in Coptic, eventually becoming the most eminent scholar in his field. 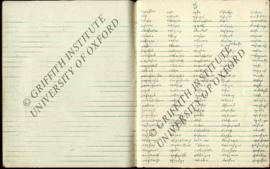 He is most renowned for his <i>Coptic Dictionary</i> which he started work on in 1892. He visited many museums and libraries compiling all available material. The <i>Dictionary</i> was published in six volumes between 1929-39. In recognition of his contribution to the subject, he was elected Fellow of the British Academy, 1931, awarded D. Litt., Oxford, 1937, Volume 25 (1939) of the <i>Journal of Egyptian Archaeology</i> was dedicated to him, and the Byzantine Institute of Boston published a volume in his honour. He published extensively in his chosen field. 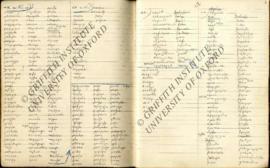 The Coptic dictionary slip index was bequeathed by Crum. The remaining material, except for Thompson correspondence, was presented by Mrs Crum after Crum's death in 1944. The Sir Herbert Thompson correspondence was presented in 1953 by Brigadier J. A. S. Crum. Photocopies of Dr Abraham Arthur Schiller correspondence with Crum were presented in 1971 by Dr Schiller himself. The estate of W. E. Crum. Additions to the correspondence group in 1953 (Sir Herbert Thompson correspondence presented by Brigadier J. A. S. Crum) and 1971 (Dr Abraham Arthur Shiller correspondence presented by himself). Mainly kept as received, arranged by type of material. Dr Jenni Cromwell revised the original typewritten catalogue in 2014. Series Crum MSS 14-18 not assigned.